The 2019 legislative session begins on Jan. 4, and committee assignments for both the House and Senate for the Democratic and Republican parties have been announced. Along with appointing the chairs, vice chairs and Democratic members of all 11 House committees, Speaker-designate KC Becker, D-Boulder, reorganized various committees. However, the House will have to adopt a House resolution and a House-and-Senate Joint Resolution that authorizes the reorganization of committees at the beginning of the 2019 session. The Agriculture, Livestock and Natural Resources Committee will be renamed the Rural Affairs Committee. It will oversee issues important to rural Colorado, such as agriculture, water, rural broadband and rural economic development. Rep.-elect Brianna Titone, D-Arvada, will be a member of this committee. The Health Insurance and Environment Committee will be renamed the Public Health and Insurance Committee. Titone, as well as Rep.-elect Colin Larson, R-Jefferson County, will also be a member of this committee. As for committee chairs from Jefferson County, Assistant Majority Leader Rep. Chris Kennedy, D-Lakewood, will preside over the State, Veterans and Military Affairs Committee. Rep.-elect Monica Duran, D-Lakewood, will be a member of this committee. Kennedy will also serve on the Appropriations Committee. What an incredible night! As we watched the results roll in, I could hardly believe my eyes. Turnout in Jeffco ended up exceeding 70% — a record for a midterm election — and voters elected Democrats all and passed progressive ballot measures all across the state. I’m very proud to have been reelected and am excited to serve a second term in the Colorado House of Representatives! For me, it felt like the result of months of hard work by so many volunteers knocking on doors, making phone calls, writing postcards, and more. But more broadly, it felt like a sign that Colorado voters wanted leaders focused on solving problems together rather than turning us against each other. I’m feeling very hopeful about the progress we’re going to make over the next two years in Colorado. Even though things are feeling very uncertain at the federal level, here we can ensure equal rights for all, advance opportunities for those working hard to support their families, and protect our clean air, clean water, and beautiful public lands for the next generation. On Thursday, the House Democratic caucus gathered to elect our new leadership team, and I was elected Assistant Majority Leader! I’m so excited to work alongside Speaker-designate KC Becker, Majority Leader Alec Garnett, and our entire 41-member caucus to make sure Colorado remains a place where everyone who works hard and does their fair share has great opportunities to be successful and enjoy the Colorado way of life. Thanks for entrusting me again to represent you at the capitol. 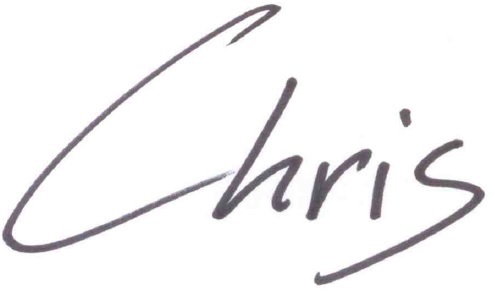 Make sure to send me your thoughts and ideas at chris@kennedy4co.com. (Nov. 8) – Earning the support of her colleagues, KC Becker was designated this afternoon by the House Democratic caucus to become the next Speaker of the House. Speaker-designate Becker served as Majority Leader in the 71st General Assembly, helping shepherd the House through two of the state’s most productive legislative sessions. Beginning her fourth and final two-year term in the House, Becker is set to serve as one of the top four individuals in the Colorado state government. Becker’s elevation to speaker will become official when the full House votes on Jan. 4, the opening day of the 2019 session. Becker represents House District 13, which includes parts of Boulder County and all of Clear Creek, Gilpin, Grand and Jackson counties. It’s the only House district that spans the Continental Divide and stretches to the Wyoming border. Prior to her legislative service, Becker served on the Boulder City Council. Becker also served as an attorney/advisor at Department of the Interior, working on environmental and natural resources law. The House Democratic caucus, which grew to least 39 Democrats – and with three races too close to call with ballots still being counted the number could expand up to 42 – elected Rep. Alec Garnett, D-Denver, as Majority Leader. Rep. Garnett was previously the Assistant Majority Leader, and served on the Education, Finance and Business Affairs & Labor Committees. “We have a lot of work to do on behalf of Coloradans,” said Rep. Alec Garnett. “They sent us here with the clear message that they support the values we ran on, from investing in education, to finding solutions to health care issues, and helping people in every community earn a good life,” said Rep. Alec Garnett. The party also flipped Colorado’s Senate in Tuesday’s elections. What a night. Democrats swept the five most competitive State Senate seats, and we picked up at least two in the House. Thank you all so much for your support, and I look forward to serving the people of HD23 for another two years! See more results at http://www.sos.state.co.us/. 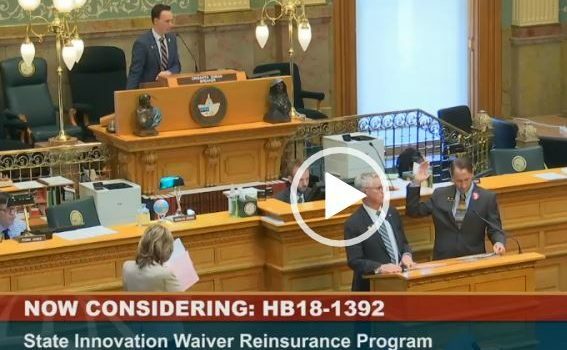 Last session, Rep. Bob Rankin (R-Carbondale) and I worked incredibly hard to pass a bill to implement an insurance reform called “reinsurance,” which would reduce premiums on the individual market by 15-30% for various regions of the state. Here in Colorado, we’re not going back to the days of discriminating against those with preexisting conditions. We must move forward and work together to reduce costs and expand access to quality health care. Though our reinsurance bill was defeated by the Senate Republicans, I’m proud of the bipartisan work we did in the House. Rep. Rankin and I are already in discussions about running the bill again next session. In addition to the incredibly importance races for federal, statewide, state legislative, and county offices this year, Colorado voters will get to weigh in on 13 statewide ballot questions and numerous local issues. While I’m not weighing in on all of them in this blog, you can read about the rest in the Blue Book. Feel free to email me any questions you may have at chris@kennedy4co.com. Amendment A: Vote yes if you want to remove the last references to slavery from our State Constitution. It’s that simple. Amendment W: I support this measure to simplify the appearance of judicial retention elections on future ballots. Amendment X: This sounds complicated, but all it’s really doing is moving the definition of hemp out of the constitution and into state statute. This will allow us to respond more rapidly if the federal government changes the rules on hemp farming, which could be a huge benefit to Colorado farmers. Amendments Y & Z: I strongly support these measures to reform our redistricting/reapportionment system and put a stop to political gerrymandering. To be fair, Colorado’s system for drawing state legislative districts already involved an independent commission, but Amdt Z improves that process significantly and Amdt Y will make the system for drawing congressional districts use that same process. The measures establish fair criteria for drawing maps and remove politics from the process as much as possible. Amendment 73: I support it and hope you do, too. Colorado’s school funding situation is dire; we’re about $2500 per kid per year below the national average. This measure asks corporations and the wealthiest 8% of Coloradans to pay their fair share to support our schools. Coupled with local funding efforts (see 5A & 5B below), Amdt 73 will help us take a major step forward to providing a 21st century school system that provides great opportunities to every Colorado kid. Amendment 74: I oppose it. Sponsored by the oil and gas industry, this measure is designed to prevent local governments from trying to regulate industry to protect the health and safety of their communities. Propositions 109 & 110: While we need to do more to repair and expand our roads and bridges, we must also recognize that increasing transit options and bike paths are important parts of the whole. I strongly support Proposition 110, which increased our sales tax by 0.62% to fund infrastructure investments. I strongly oppose Proposition 109, which effectively forces the legislature to make deep cuts in education and health care in order to fund transportation. Proposition 111: I support this measure to crack down on the exorbitant interest rates being charged by payday lenders. This kind of predatory lending hurts the people who are struggling most to get by. As for the rest, I’m still weighing pros and cons. Let me know what you think at chris@kennedy4co.com. Jeffco School District Issues 5A&B: I support both Our schools are in need of more funds to attract and retain great teachers and maintain our facilities. While we’ve worked hard to increase school funding at the state level, we’re still well below the national average. Learn more at WeAreJeffco.com. Lakewood Issue 2D: I support it. Without raising taxes, Lakewood voters can choose to allow the city to retain dollars above the TABOR limit to increase our investment in parks, police, and potholes. I think these are smart and needed investments. Learn more at OurLakewood.org. West Metro Fire Protection District Issue 7C: I support it. Because of the Gallagher amendment (long story), our fire district’s revenues are very uncertain in the years ahead. Without raising taxes, district voters can stabilize future budgets and make sure we don’t have to cut our fire protection. Learn more at LifeSavingAlliance.com. Urban Drainage and Flood Control District Issue 7G: I support it. Colorado’s bizarre constitutional requirements have ratcheted down this special district’s mill levy by 44%, putting real strain on our infrastructure. By allowing this special district to restore it’s original 1.0 mill levy, we can do a better job investing in storm water systems and other infrastructure across the Denver Metro area. Learn more at UDFCD.org. I believe that everyone who works hard and does their fair share should have a fair shot to get ahead and enjoy the Colorado way of life. Though our economy is booming, the rapid growth and high cost of living are making it hard for too many Colorado families to get by. I believe we must do more to make sure our economic growth benefits everybody – not just the folks at the top. I can’t speak to my opponent’s policy positions, but I believe my commitment to LGBTQ rights, reproductive freedom, and fighting climate change are likely contrasting positions. I also believe we need to do more to fund education, transportation, affordable housing, mental health, and other priorities in Colorado. That means we must demonstrate to Colorado voters that we are making responsible decisions with their tax dollars and ask them to consider raising their own taxes to fund these key priorities. We can’t cut our way to prosperity. The one time I’ve heard my opponent speak, she praised some of Jeffco’s nonprofits for the important work they’re doing in our community. I couldn’t agree more. The partnerships between government and the nonprofit world are critical to providing the services that so many Coloradans depend on. Where would you like to see Colorado’s transportation system in two decades, and what’s the best way to get there? What’s your position on the competing state transportation initiatives? While we need to do more to repair and expand our roads and bridges, we must also recognize that increasing transit options and bike paths are important parts of the whole. I strongly support Proposition 110, which increased our sales tax by 0.62% to fund infrastructure investments. I strongly oppose Proposition 109, which essentially forces the legislature to make deep cuts in education and health care in order to fund transportation. What role, if any, should the state legislature play in managing the impact of growth along the Front Range and ensuring that rural areas share in the benefits? Growth is the number one concern I hear about when I’m knocking on doors. While we may not be able to control growth, we can certainly stop incentivizing it by trying to attract big companies to relocate here. We must figure out how to make growth pay its own way so that it doesn’t put so much strain on our roads, neighborhoods, and available housing. Colorado’s health insurance exchange and Medicaid expansion have given hundreds of thousands more residents coverage, but health care remains a top concern in state polls. Affordability and access are particularly challenging in remote areas. Where should the state go on this issue, and what will you do to get us there? The Affordable Care Act did a lot to expand access so that more people could get health insurance, but by building on top of a broken system, little was done to control costs. We must push further on ideas like cost transparency for hospitals and pharmaceuticals while taking steps away from the fee-for-service system and moving closer to a value-based payment system. We must also work on insurance reforms that will allow everyone in the state to access insurance with reasonable premiums and deductibles. To do that, we need to explore either a reinsurance program, and public option, or both. Joan Poston has not returned the questionnaire. The Physical Therapy Program in the University of Colorado School of Medicine recently held an educational day titled, “Pain & Healthcare in Society: Changing Attitudes, Behaviors and Health Systems to Address the Opioid Crisis.” The event drew 250 students, alumni and community members from various disciplines. The event was focused on improving pain management through a better knowledge of systems-level barriers to achieving effective collaboration, a deeper understanding of pain management across health care disciplines and examples of innovative approaches to pain management and collaboration. CU welcomed speakers from other areas of the University, including Venu Akuthota, MD, chair of the Department of Physical Medicine & RehabilitationParticipants from other institutions included Colorado Rep. Chris Kennedy (D-Denver) and national thought leaders Anthony Delitto, PT, PhD, FAPTA, dean of rehabilitation science, the University of Pittsburgh; Alice Bell, PT, DPT, of the American Physical Therapy Association; and Robert Saper, MD, MPH, from Boston University. ; Rob Valuck, PhD, of the Skaggs School of Pharmacy and Pharmaceutical Sciences; and Daniel Goldberg, JD, PhD, of the Center for Bioethics and Humanities. Participants from other institutions included Colorado Rep. Chris Kennedy (D-Denver) and national thought leaders Anthony Delitto, PT, PhD, FAPTA, dean of rehabilitation science, the University of Pittsburgh; Alice Bell, PT, DPT, of the American Physical Therapy Association; and Robert Saper, MD, MPH, from Boston University. Areas of discussion were focused on the history and scope of the opioid crisis, barriers and opportunities for inter-professional collaboration and examples of innovative solutions and ideas for managing pain holistically, equitably and effectively. 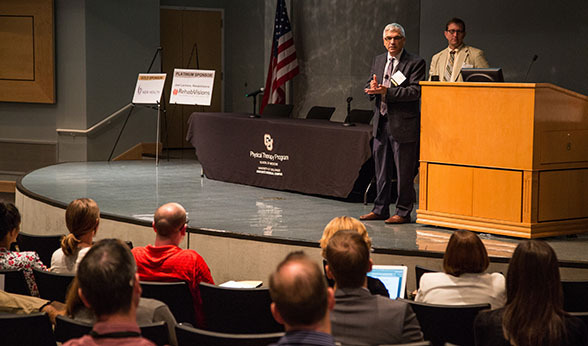 Not just a day of presentations, a core group of professionals met following the event to brainstorm action items for the Physical Therapy Program, UCHealth and the CU Anschutz campus community. Event sponsors were RehabVisions, Aegis Therapies and New Health. By Eli Pace (September 17th, 2018) Saying it could save Coloradans up to 40 percent or more on their health care costs, gubernatorial candidate Jared Polis rolled out a 100-day, multi-point roadmap Monday in Frisco to reform the state’s health care system. Winning the democratic primary in June, the congressman from Boulder is set to face Republican Walker Stapleton in the November election. While many in the GOP believe surging state and national economies will rank high on voters’ minds at the ballot box, Colorado Democrats are appealing to people with promises of lowering the cost health care and framing it as an economic issue. “You know, health care is an important issue because it’s a big part of our economy and it’s a big cost factor that affects Colorado families,” Polis said before his running mate, Dianne Primavera, added that the Medicaid expansion brought roughly 20,000 new jobs to Colorado alone. 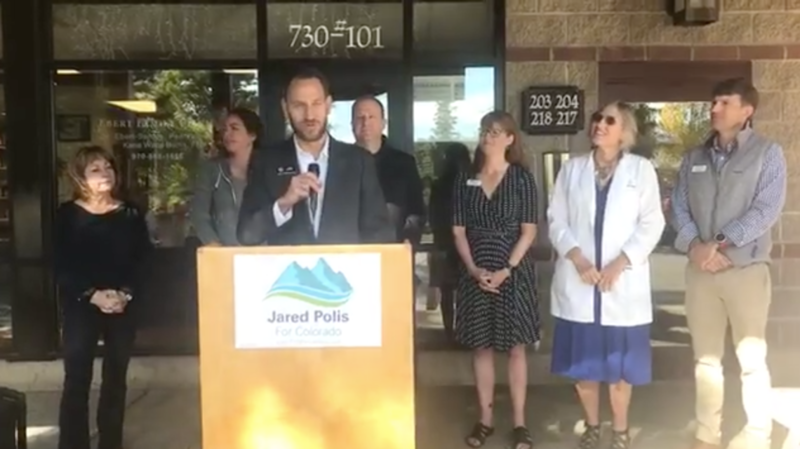 Polis decided to roll out his plan at the Ebert Family Clinic in Frisco, he said, because of Summit County’s unique position as a superbly healthy community that pays too much for health care. By almost every measure, Summit is one of the healthiest places in the U.S. The county has earned a No. 1 nationwide ranking for life expectancy, has one of the lowest cancer mortality rates and stands as one of the leanest counties in the country’s fittest state. Despite all that, Summit still has some of the highest health care costs in the U.S. with locals often paying three to five times what they would for the same care on the Front Range. Those costs are frequently passed onto consumers in the form of higher health insurance premiums here, too. I hope you and yours have enjoyed some of the warm weather, and I hope you’ve enjoyed the much-needed moisture, too! On the legislative front, the Opioid and Substance Use Study Committee has started up again to build on the great progress we made in this most recent legislative session (read more here). We’ve had three all-day hearings so far to get feedback from pharmacists, doctors, hospitals, treatment and recovery professionals, and many more stakeholders about the gaps that remain in our system. I’m excited that these subject areas seem to be picking up some real bipartisan support, and we’ll keep on plugging away!